The new CA MPN has been approved by the California Department of Industrial Relations to treat workers injured on the job. Experience has shown that medical outcomes for injured workers can be improved when employees are given a choice of provider(s) in an approved medical provider network. Visit this page to find a provider near you through the CorVel website or download their app for remote access. Alternatively enter your email address here for remote access and to create a formal panel of physicians. (Please note an instant automatic reply will be sent to your email address with the log-in information). NOTE: MSIG urges all policyholders to participate in our MPN. To all injured workers when changing from an existing MPN to another MPN within 60 days. To all employees when changing from an existing MPN to another MPN if more than 60 days have lapsed since ceasing use of a prior MPN. MSIG will provide the Complete Employee Information notice (0056 Mitsui Sumitomo Ins of America or 2039 Mitsui Sumitomo Ins USA) to the employee once the injury has been reported to MSIG. This will serve to educate the employee regarding the MPN and advise the employee how to access the MPN network. The MSIG Claims Office in Los Angeles, CA, can assist you with any questions.Please contact one of our representatives at (800) 365-4671. Press 3 to reach the Workers’ Compensation Claim Department. Under the Illinois workers’ compensation system, employers can create Preferred Provider Programs (PPP) for workers’ compensation. MSIG is offering the availability of a PPP for our policyholders. To assist you in complying with the new regulations, we are providing the PPP Employee Notification Packet. If enrolling in the PPP, it is mandatory for the employee to receive a complete copy of the PPP Employee Notification Packet at the time the injury is reported. This packet contains the following. If an employee does not want to use the PPP, he or she must notify the employer in writing. Employer/policy holder should keep an active log of opt-out notices received. Please notify MSIG if the injured worker has opted out. This is very important to the claims handling process to ensure appropriate care is provided. At MSIG, we believe that timely, early reporting of a claim is the best approach to containing your workers’ compensation costs and assuring your employees receive appropriate medical care. Participation in the PPP will help support medical cost containment and facilitate prompt return to work. If you are interested in participating, please notify MSIG. The New York State Workers’ Compensation Board Rule 300.37 mandates that a New York employer provide a “Claimant Information Packet” to an injured worker at the time of the injury. To assist you in complying with this mandatory regulation, you can download the Claimant Information Packet, here. This requirement applies only to New York State workers’ compensation claims. Texas House Bill 7 was signed into law on June 1, 2005. This law allowed for the implementation of health care networks on or after January 2006. 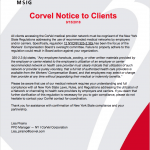 Since partnering with CorVel Corporation, the CorVel Texas Health Care Network (HCN) has been available to MSIG customers. The CorVel HCN offers widespread coverage in the densely populated areas of Texas.